Hi, I'm Mizuki from the Entertainment Analysis and Development Department (EAD). I worked as the director for the Wii Shop Channel. I'm Haruhana, and I'm also from EAD. I was responsible for the UI screen design. I am Imamoto from the Research and Development Department. 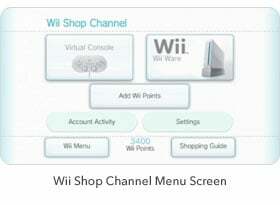 I worked on managing the server design for the Wii Shop Channel. And I'm Koyama, also from the Research and Development Department. For the Wii Shop Channel, I worked in coordinating the development process with our team and our overseas partner company that runs and had helped us develop the servers. The Wii Shop Channel is a Channel where you can purchase and download new Channels and software for the Virtual Console. Since this was going to be Nintendo's first attempt at digital distribution, the development process started very early. The shopping structure, and the framework for the controls were mostly complete by the time we teamed up with Mizuki-san's Department. From there we just needed to design the actual UI that would be used by our customers. Originally, the UI design was supposed to be handled by the development team that was in charge of the Wii Menu, but at the time they had their hands full working on the Wii Menu itself. I then looked around for help, but I wasn't able to find anybody that could have helped us out. That's when I realized that I had to take things into my own hands. At the time, I was taking part in the development of both Wii Sports and Wii Play, and seeing that these two titles were well on track, I joined the development team of the Wii Shop Channel. When I make up my mind, I'm very determined! (laughs) Anyways, I needed to find someone who could be in charge of the design, and I went to ask Mizuki-san for help. But that was around the time where all the titles for Wii were in their last stages of development, and all the designers were already taken by those projects. That's when Miyamoto-san had asked you "Haruhana-san, could you do it?" Haruhana-san is usually the person that coordinates all the designers, and he'd been suddenly requested to fight in the frontline. Having two dependable people like yourselves joining our team was definitely a breath of fresh air. Nobody was available around that time because they were already busy, and we weren't expecting anybody new to join our Wii Shop Channel team for a long time! Already having a demo version at that point, we just needed someone who could create its shell and give it substance. So, once I was put in charge, I was able to present design plans to Iwata-san in about three to four days. I was able to get moving right away because the demo version was already finished, but that demo was made such a long time ago; it was made back when there was not a set image on how Wii should be. From a very bare, rather mechanical demo that only had the necessary functions, I started by adding on design features that were distinctive to Wii. The basic things like the way it displayed the menu hadn't changed, but the actual design changed drastically from the demo version. Since I was going to be involved with the development of one of the Channels, I went to talk to some of the staff that was working on the Wii Menu. I remember one of the things that I heard was "the good thing about each of the Channels is that they all have their unique characteristics". So that was when I started to think that the Wii Shop Channel needed a characteristic that it could call its very own. It's just that the Channel's main purpose was so that it could provide a place where our customers could shop, so we knew it would not be a good idea to make the Channel too design-centric, or base the design off of something well-known that already exists. It's just not right making the merchandise shelf stand out too much. Even if we made a really fancy shelf, there would be no point if many of our customers didn't like it. So we decided to base the overall atmosphere to match Wii's colors. I studied a lot of retail websites when I was deciding on how to organize all the information, but all these websites had so much information packed inside one page, and I felt that this wasn't what we wanted to have on Wii. I think designing the interface so that it can be easily used by people who are not accustomed to browsing online, is an important part of Wii's characteristics. To do that, I first had to think of ways of designing the interface where people are able to figure out what to do just by taking one look at the screen, so I started by eliminating all unnecessary elements and left only what was truly needed. So we then moved on to the design process, but in order to verify any changes we made in our design, it first had to be uploaded to the server. Every time we had a new design, we had to contact our overseas partner company who was helping us develop the servers. We had to do this many times, so the design process took much longer than working on a typical video game. When you try to communicate with people in other countries, it's very difficult to explain the details of what you really want to get across in words. And there's also the issue where you are in different time zones. At first, there were times when we saw the new screen the day after we handed them the files, and things looked very different. Also, many versions of the interface screen had to be built for all the different regions. We were also met with a language barrier here as well. For example, words in Japanese that are only a few characters long, are much longer when you spell them out in German and Dutch. The actual space allowed for the words to be displayed are fixed, and all these words of different length had to fit within them. In the past, I had worked on Mario Kart: Double Dash! !, which was released simultaneously in Japan, US, and Europe and from that experience, I had an idea of how hard it is to work with people in other countries. Because he had that experience, Mizuki-san was constantly reminding us how we wouldn't be able to meet the deadline if things weren't finished by a certain date. That, I think had helped us greatly in being able to meet the deadline. Mizuki-san speaking from his personal experience was really effective! To be able to release this simultaneously worldwide, the first thing we had to take care of was actually not the engineering aspect, but it was the legal aspect. Since we were dealing with monetary issues, there were a lot of things that had to be cleared out legally. Since I live in Japan, I'm naturally aware of the laws here in Japan, but that's not the case when it comes to the laws in other countries. For example, there are twenty, thirty countries in Europe, and they all have different laws and tax structures. With the US, they have different tax rates for every state. Regarding the issues with both domestic and international laws, taxes, and accounting, we spent many hours of discussion with other departments. And as a result, we were able to finalize the handling and structure of the Wii Points to the way that it is now both in Japan and countries overseas. Thanks to this, I became a lot more aware of how things work overseas. With typical software development, all the tuning necessary can happen just within the department developing the software, but since the Wii Shop Channel involved creating a completely new service and a business model, it became a huge project where a lot of departments, including overseas ones, were involved. Speaking of differences between Japan and overseas, displaying the rating symbols, which are used to describe the game's contents and show what age group that game is suitable for, was also something we had to work on. These logos are different in each country, and there are so many types of them! As we continued to work on the design, we became much more familiar with what associations are in what countries, and what their rating systems were. With some of the European countries, even though they are in the same association, each country has their own way of displaying the ratings, like one displays whether the game has any violent scenes, and another displays whether the game has scenes with alcohol...there are just so many. And depending on the software, some are required to display multiple symbols, and some need to display disclaimers, and these things get more detailed and complicated. Even with the screen that describes the software, we had a goal in making it as easy to understand as possible, and we had a hard time making all these symbols fit inside the screen. If we made the information too small, then you wouldn't be able to read the letters on TV screens. We had set a guideline within the team to make everything viewable with a 15-inch monitor, and we designed it paying attention to the closest detail so the letters and symbols can be clearly read. With all the mandatory information and disclaimers that had to go in, the design process felt as if we were designing an instruction manual, or a product package. We had to do things in a certain way, and our job was placing everything within the way it had to be placed. Although these are things that don't really stand out, it was a huge task with great responsibility. When you purchase Virtual Console software, an icon of the software you purchased will get added to the Wii Menu, and that's just a lot of fun. It's fun seeing the slots in the Wii Menu getting filled up. Like the way there are empty slots in the Pokédex in the Pokémon games, there's a lot of fun in filling in all these slots. It makes you want to go back in time and tell that to your childhood self! (laughs) This is about back in development; one of the staff who helped us with debug was getting really into playing one of the downloaded PC Engine (TurboGrafx-16) games. When I saw that, I thought to myself, "wow, Wii is such a strange hardware!" (laughs) It's strange how you're able to play software from other companies on a Nintendo console. That's when I felt firmly that it would be a lot of fun if all these games could be displayed on the Wii Menu. When you see an icon of the Famicom (Nintendo Entertainment System) being displayed on the Wii Menu, you do get a funny feeling. Back in the early demo version, the Channel was actually controlled using the GameCube controller. But once this was switched over to the Wii Remote, it just didn't work the way it was supposed to...When we successfully downloaded software using the Wii Remote, we felt very relieved. We felt it finally became something that was made for Wii. As the person that is in charge of the servers, it was a little hard for me to fully realize how much of my work was going to have an effect; but once I experienced downloading software and playing it using the Wii Remote, I thought "so this is how people are going to play it", and it felt real. I was able to imagine how Wii would be played in somebody's house. At that time I was able to reaffirm my responsibilities and my values. In the Wii Shop Channel, I would like people to take a moment to listen to the music. We actually held a discussion as to whether background music was really needed in a Channel that handled digital distribution. But thinking how they play music in an actual retail store, we asked Totake-san, who was in charge of the music in Animal Crossing, to make a song for us. Thanks to that song, even if the customer decides not to download anything, I think it became a Channel where our customers are able to enjoy it, as if they're window shopping. Although, since the entire concept was very different from a conventional video game, it seemed like he had a hard time coming up with the song. The way that Mario unexpectedly appears in a non-game moment during download of software, I think was put together really well thanks to the background music. In developing the Wii Shop Channel, we focused on making everything as clear as possible, so we really weren't able to put a lot of playfulness into it. So the one area that we were able to really put in a whole lot of the fun factor was in the download screen, where Mario appears. I'm thinking that there are people who have seen it, but I think they just looked at it without realizing how rare it is, thinking "ah...they're swimming"! (laughs) Maybe it was too rare...? Even though these things were put in to be fun, we actually had Miyamoto-san, check it thoroughly, and he had given us pointers like "why don't you make him run sideways?" This is the part where the heart of the developer went in! (laughs) By the way, there are a total of six types of animations that play during download. Also, when Mario gets one coin during download, that download's one percent complete, and when he gets all one hundred, the download completes. However, the number of the coins may get shortened depending the amount of data and the downloading speed. When he's collecting a lot of coins very fast, that means it's downloading a lot. But when he's only getting a little bit at a time, that either means the line's really slow, or there a quite a bit of data left to be downloaded. By the way, when the download speed is slow, I'm sure it will take quite a bit of time for the software to finish downloading. But even if the power goes out or the download gets cut off, you're able to download it again as much as you like. There will never be a case where the customer had paid for the software, but is unable to download it. Also, the information about what software each of our customers' Wiis have downloaded are stored in our servers. So even if you delete the game from the Wii Menu, you can download it again without having to pay for it a second time. There are only 48 available slots on the Wii Menu, and I think there may be some customers that worry that once all the slots have been filled, they wouldn't be able to download anymore software, but the software you purchased can be downloaded over and over again, so it's safe to delete that software from the Wii Menu. The Wii Shop Channel may not get as much attention as our flagship titles like Zelda and Wii Sports, but in fact, it's used by a lot of people, and every time a new Channel is added, it's always downloaded from the Wii Shop Channel. It's a little strange if you think about it. In reality, when the trial version of the Internet Channel was distributed, and when the Everybody Votes Channel had started, rather than these Channels magically appearing on the Wii Menu, they had to be downloaded from the Wii Shop Channel. These things made me realize that the Wii Shop Channel is functioning exactly the way it should, by adding new Channels to the Wii Menu. From the server side, you're able to check how much things have been downloaded, and at first I was looking at the numbers thinking "OK, these aren't bad". But when the download of the Internet Channel had started, that number had increased by tenfold! It was the same when we introduced the Everybody Votes Channel; our customers had reacted very quickly, and I thought the possibility of the Wii Shop Channel had expanded even more. Lately, I get frequently asked by my relatives about Wii, asking me things like "isn't that Wii product being made by your company?" And these are from very old people, who normally would not have anything to do with video games, and they're telling me that they've downloaded the Internet Channel. At that time I realized that my work was having an effect on others. This is going to be a personal request, but I wish that it became more like a museum. For example, if you ask a hundred people "what's your most memorable game? ", they might all answer a different game. I don't think that there's a single game that can be considered the most memorable by all these people. So being able to see for myself as to how much these memorable games can be highlighted, is something that I am very interested in personally. I also would like to play the old arcade versions of the games. Not the Famicom versions, but games like the arcade version of Donkey Kong. Miyamoto-san seems to have stronger feelings towards the arcade version, too. Lately, it's becoming popular to read manga with cellphones,1 but it may be fun if you're able to download manga using Wii, and able to read it on your TV. Ultimately, I think it comes down to whether or not it can only be done with Wii. For example, there's the Slide Show feature in the News Channel, the Forecast Channel has the Globe, and the Everybody Votes Channel has its Miis, and all these things are characteristics that make these Channels unique. Whether it's distributing manga or videos, when we can find a way to show these new thing in a way that only can be done with Wii, we might have a new Channel coming our way. 1. Manga, or Japanese comic books, are becoming increasingly popular to read on cell phones in Japan. Cell phone users can read popular mangas from the past, and newer mangas that are created to cater specifically to the cell phone audience.